A sensitivity analysis is the first step in assessing the possible range of results that can be derived from the groundwater model. In a sensitivity analysis, parameter values are individually changed to determine the effect on model calibration and prediction. The results give an indication of which parameter changes can have significant impact on the model results (these are sensitive parameters) and which parameter changes have little or no impact on the model results (these are non-sensitive or insensitive parameters). 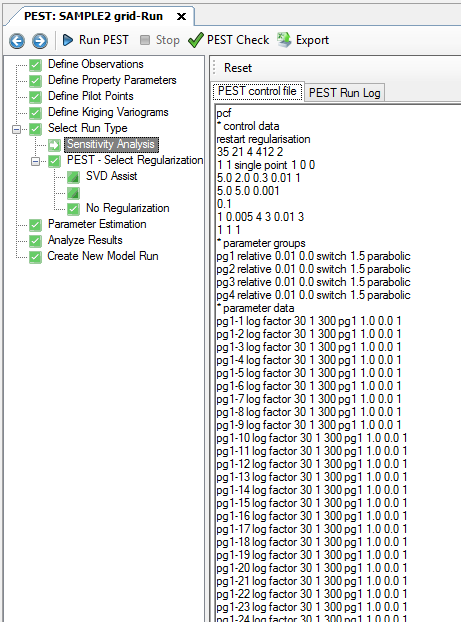 This should help you to properly select parameters to include in a PEST run, as you should focus more on the sensitive parameters, and less on the non-sensitive parameters. 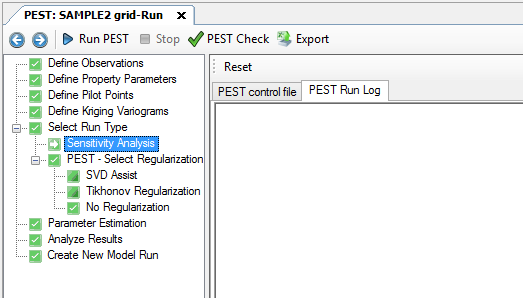 Under the "PEST Control file" tab, you can see the PEST control file has been automatically generated for you with the appropriate settings for a Sensitivity Run. 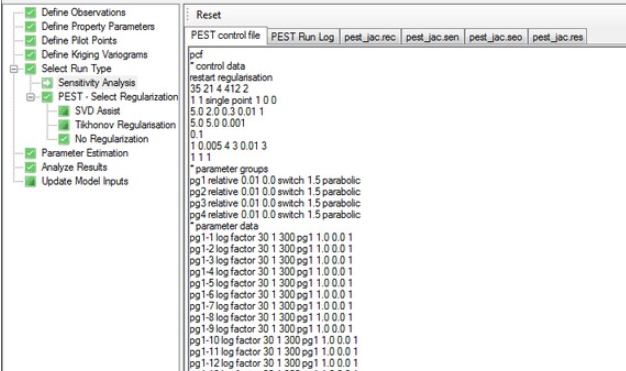 Click on to start the PEST Run; you should see the PEST progress in a DOS window. When the run completes, you will see several new tabs added to the workflow window. Select the appropriate tab and you will see the sensitivities for the parameters and observations, along with other useful PEST run results.